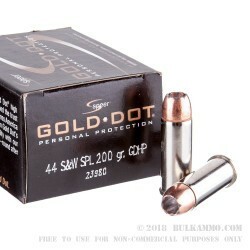 A dedicated self-defense cartridge for the .44 S&W Special with a 200 grain projectile that is from the venerable Gold Dot line by Speer. This is a round that is milder on the wrist, potent enough for just about any scenario and clearly offers the best stopping power in the .44 Special game. 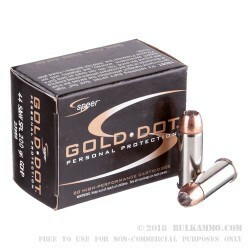 The Speer Gold Dot is among the most proven and reliable projectiles in modern hand gunning history. 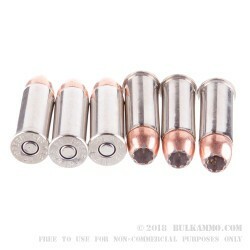 The 200 grain bullet and the significant static ballistics of the .44 S&W Special means you don’t have to settle for uncomfortable recoil or ridiculous overpenetration concerns; instead you can just shoot this ammunition that offers great stopping power, great reaction for the shooter and a proven performance cycle. Speer leverages its significant law enforcement contracts in every product it releases, and that data and information gathered through their incredible amount of contracts in invaluable to the shooters. These shooters know it just makes good sense to trust your life with a round that has been proven to work for law enforcement professionals all over the United States and beyond. 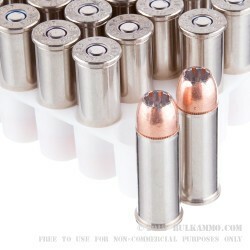 A premium nickel plated brass casing with a Boxer primer means this load is reloadable on your own terms easily.